Though Smith (965 passing yards, 7 TD, 1 INT) has been terrific in his game- manager’s role, expect the 49ers to lean heavily on the powerful legs of Gore (400 rushing yards, 3 TD, 10 receptions), who’s put up at least 125 rushing yards in back-to-back weeks, on Sunday while sprinkling in the promising rookie Hunter (133 rushing yards, 1 TD, 4 receptions) on occasion. Not only does Harbaugh want to keep Detroit’s quick-strike offense off the field as much as possible, but San Francisco is dealing with two key injuries at the wide receiver position, with veteran Braylon Edwards set to miss a fourth straight week with a knee sprain and usual contributor Josh Morgan sustaining a season- ending leg fracture in last week’s victory. When Smith does drop back to pass, he’ll be fixed mostly in the direction of athletic tight end Vernon Davis (22 receptions, 3 TD), who’s fresh off a two-touchdown performance against the Bucs, and inconsistent 2009 first-round pick Michael Crabtree (11 receptions). Also look for the Niners to employ plenty of two-tight end sets involving the versatile Delanie Walker (9 receptions, 2 TD), a strong in-line blocker for the running backs who can be utilized as a third receiver. Airing it out isn’t usually San Francisco’s method of operation, as the team ranks last in the NFL in pass attempts and 29th in passing yards (183.0 ypg). The Lions will be aware that the 49ers want to establish the run, but preventing their foe from doing so could be a bit tricky. Detroit is allowing a mediocre average of 4.8 yards per rush thus far, which Chicago’s Matt Forte compiling 116 yards on 22 carries against the group on Monday, and linebackers Stephen Tulloch (32 tackles, 1 sack, 1 INT) and DeAndre Levy (36 tackles) figure to be busy one week after teaming up for 19 tackles against the Bears. The Lions can be tough to throw on, however, with playmaking cornerback Chris Houston (26 tackles, 3 INT, 7 PD) and free safety Louis Delmas (25 tackles) heading up a solid secondary that’s backed by a strong pass rush that was in Jay Cutler’s face all throughout Monday’s game. A defensive line anchored by 2010 NFL Defensive Rookie of the Year Ndamukong Suh (16 tackles, 2 sacks) is one of the best in the business, with ends Kyle Vanden Bosch (13 tackles, 3 sacks) and Cliff Avril (11 tackles, 2 sack) both accomplished sack artists in their own right. On the injury front, strongside linebacker Justin Durant (21 tackles) may be held out a third straight week due to concussion symptoms, though journeyman Bobby Carpenter (11 tackles, 1 INT) has been filling in ably. Detroit will take a much different offensive approach than the 49ers into this contest, allowing the strong-armed Stafford (1436 passing yards, 13 TD, 4 INT) to vertically stretch the field with a vast array of quality targets that have accumulated an average of 283.8 passing yards per game (7th overall). None has been more dangerous than Johnson (29 receptions, 451 yards, 9 TD), one of the league’s premier deep threats who scorched the Bears for 130 yards on just five catches in Week 5 and has yet to be kept out of the end zone this season. 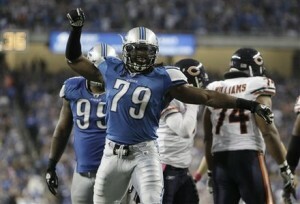 His ability to command double-teams also helps open up underneath routes for reliable tight end Brandon Pettigrew (26 receptions, 1 TD) and speedy running back Jahvid Best (353 rushing yards, 21 receptions, 3 total TD), while veteran Nate Burleson (17 receptions) and rookie Titus Young (14 receptions) are outside options that must be accounted for as well. Best is an explosive dual threat out of the backfield who’s averaging 4.8 yards per rush attempt at home over his career and broke out for a career-high 163 yards on only 12 carries against the Bears, most of which came on a game-changing 88-yard touchdown burst in the third quarter. Still, Detroit hasn’t been overly effective running the football, ranking a mere 24th overall (95.8 ypg) in that category. Another reason Stafford’s expected to be throwing early and often come Sunday is that the 49ers boast one of the better run defenses in the game. Opponents have managed a scant 76.4 yards per game on the ground (4th overall) against a San Francisco stop unit that fields three outstanding stuffers in four-time Pro Bowl linebacker Patrick Willis (40 tackles, 4 PD), inside counterpart NaVorro Bowman (42 tackles) and rugged lineman Justin Smith (15 tackles, 3 sacks). The Niners enter this week’s play not having allowed an enemy running back to surpass the 100-yard plateau in 27 consecutive games, the longest active streak in the NFL. San Francisco has also been very good at forcing turnovers, having recorded three takeaways in each of its four wins and 14 on the season. Cornerback Carlos Rogers (13 tackles, 3 INT, 7 PD), a free-agent acquisition during the offseason, has proven to be an astute pickup, with the ex-Redskins having notched an interception in three straight weeks and taking his last pick 31 yards for a touchdown in the Tampa Bay game. Rookie outside linebacker Aldon Smith (7 tackles), the club’s first-round selection in last April’s draft, has also provided a boost as a pass-rusher by registering 3 1/2 sacks over the past two games. Detroit’s primary objective has to be to keep Gore in check. The 49ers aren’t built to win with Alex Smith slinging it around 35 or more times in a game, especially with the depleted receiving corps the reborn quarterback will be saddled with on Sunday, and a San Francisco offensive line that’s allowed 14 sacks this year will likely encounter trouble dealing with the Lions’ stout pass rush if the team is placed into obvious throwing situations. For San Francisco, it’s about continuing to create the turnovers. The Niners own an NFC-best plus-10 takeaway-to-giveaway ratio on the season and have forced 12 mistakes out of the opposition in their four wins. That may be a task easier said than done this week, though, as the Lions have turned it over only four times in five games and have a plus-seven margin. Start fast. Establishing an early lead will allow San Francisco to stick to its game plan of running the football and controlling the clock, which should enhance its chances of coming out with a victory. While the Lions have unequivocally shown they can come from behind, jumping out in front would take the 49ers out of their comfort zone and play to their own strengths. 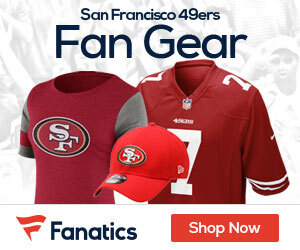 Video: Do The Niners Have What It Takes To Beat The Packers? Be the first to comment on "49ers Gab NFL Week 6 Preview – San Francisco at Detroit"